TAHOE-TRUCKEE, Calif. — Want to book a last minute massage and not leave the comfort of your own home? 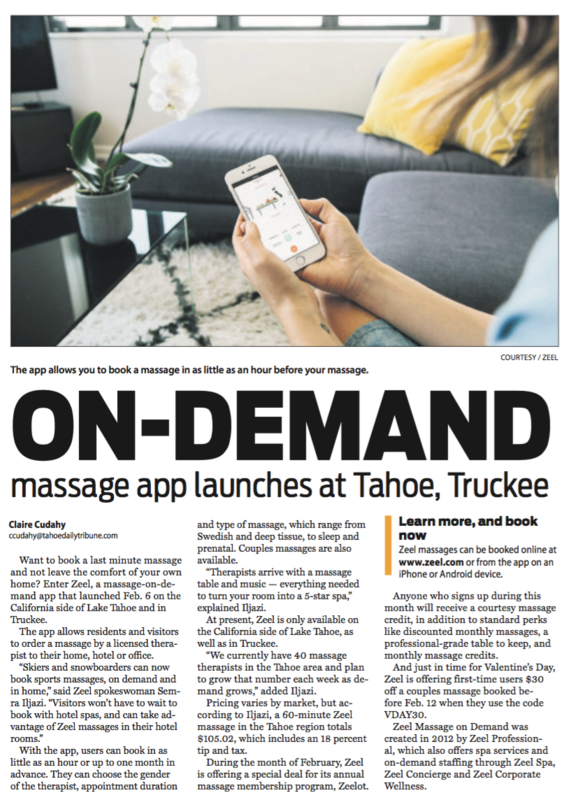 Enter Zeel, a massage-on-demand app that launched Feb. 6 on the California side of Lake Tahoe and in Truckee. The app allows residents and visitors to order a massage by a licensed therapist to their home, hotel or office. “Skiers and snowboarders can now book sports massages, on demand and in home,” said Zeel spokeswoman Semra Iljazi. “Visitors won’t have to wait to book with hotel spas, and can take advantage of Zeel massages in their hotel rooms.” With the app, users can book in as little as an hour or up to one month in advance. They can choose the gender of the therapist, appointment duration and type of massage, which range from Swedish and deep tissue, to sleep and prenatal. Couples massages are also available. “Therapists arrive with a massage table and music — everything needed to turn your room into a 5-star spa,” explained Iljazi. At present, Zeel is only available on the California side of Lake Tahoe, as well as in Truckee. “We currently have 40 massage therapists in the Tahoe area and plan to grow that number each week as demand grows,” added Iljazi. Pricing varies by market, but according to Iljazi, a 60-minute Zeel massage in the Tahoe region totals $105.02, which includes an 18 percent tip and tax. During the month of February, Zeel is offering a special deal for its annual massage membership program, Zeelot. Anyone who signs up during this month will receive a courtesy massage credit, in addition to standard perks like discounted monthly massages, a professional-grade table to keep, and monthly massage credits. And just in time for Valentine’s Day, Zeel is offering first-time users $30 off a couples massage booked before Feb. 12 when they use the code VDAY30. Zeel Massage on Demand was created in 2012 by Zeel Professional, which also offers spa services and on-demand staffing through Zeel Spa, Zeel Concierge and Zeel Corporate Wellness.